Today, we announce the broader regional availability of the industry-leading performance provided by Azure SQL Data Warehouse (Azure SQL DW). Azure SQL DW is a fast, flexible, and secure analytics platform offering you a SQL-based view across data. It is elastic, enabling you to provision a cloud data warehouse and scale to terabytes in minutes. 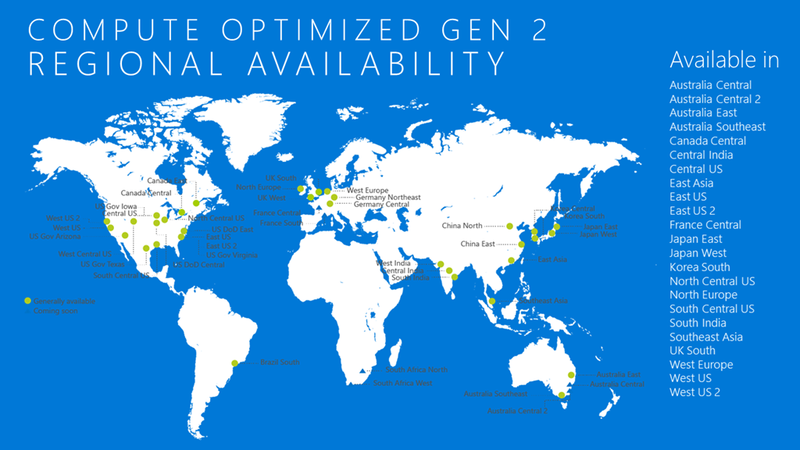 Compute Optimized Gen2 tier is now rolled out to three additional Azure regions— Australia Central, Australia Center 2, and France Central. These new locations bring the product worldwide availability count for Compute Optimized Gen2 tier to 22 regions. Azure SQL DW Gen2 brings the best of Microsoft software and hardware innovations to dramatically improve query performance and concurrency. Our customers now get up to 5 times better performance, on average, for query workloads, 4 times more concurrency, and 5 times higher computing power compared to the previous generation. Azure SQL DW can also serve 128 concurrent queries from a single cluster, the maximum for any cloud data warehousing service. We would love to hear from you about what features you would like us to add. Please let us know on our feedback site what features you want most. Users who suggest or vote for feedback will receive periodic updates on their request and will be the first to know when the feature is released. Also, you can connect with us if you have any product questions via StackOverflow, or via our MSDN forum.